Real time demonstration to show the power of automated optimization of compounds, showing the speed DiscoveryQuant™ software can build MRM methods on QTRAP systems and the color coding to see at a glance if your compounds have passed or failed. 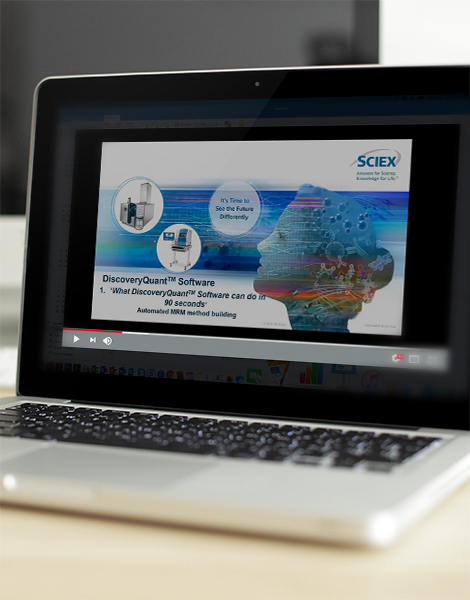 See in detail the starting conditions for optimizing compounds in 90 seconds and reduce the problems that can be encountered so you get the maximum number of compounds optimized. Video 3: ChromaTune – Testing your optimized MRM methods, leave nothing to chance! Get to know more about how ChromaTunes adds value to the compound optimization and see how easy it is to use. See how to build methods and access the optimized MRM compound parameters in the database along with the ways of building large batch of samples containing many different methods that can also be used in Analyst® Software. See how DiscoveryQuant™ software allows you to do data review and interpretation quickly and easily. If you require more in-depth data review you can simply use MultiQuant™ software.